Jillian Clark BJ Barham performs at Visulite Theatre on Sept. 1. BJ Barham was in Brussels, less than an hour from Paris, when terrorists struck the French capital last November. The attackers killed 130 people, most of them at an Eagles of Death Metal show at the Bataclan. In this charged atmosphere, he and his American Aquarium bandmates headed away from the epicenter and toward Holland. Along the way, Belgian police stopped and searched them — they were traveling in a giant Sprinter van with out-of-country plates, Barham points out — but the Raleigh band eventually made it across the border just before it was shut down. They'd planned for several days off anyway, and it turned out they needed them. "It's a lot to take in, especially when you're an American band in Europe and you hear about a terrorist attack in a music venue an hour away," Barham says. "You start questioning — are there going to be more?" Over the next few days, hunkered down in Holland, Barham wrote prodigiously. He didn't put any thought into what the songs had in common — he simply put them to paper. A clear theme emerged, though: the usually autobiographical country-rock songwriter found himself writing fictional tales set in his hometown, the rural North Carolina town of Reidsville. "The fact that the first place my mind went was where I grew up was weird," Barham says. "It's kind of like a kid calling for mommy when he gets scared." Granted, Barham, who plays Visulite Theater on Sept. 1, has always owned his roots. Over 11 years heading the hard-touring American Aquarium, he has addressed his small-town upbringing time and again. In fact, a substantial part of Barham's magnetism is that he is exactly what he says he is: a small town boy of humble, hard-working stock with a gift for spinning his experiences into populist anthems. On his solo debut, which had its genesis in those fraught few days in Holland, he zeroes in completely on his hometown. Barham's new album Rockingham is named after the county Reidsville is in. As specific as that is, though, listeners from as far from North Carolina as Texas, Wyoming and Wisconsin have told Barham how personal these songs are for them. As Barham realized, most everyone has their own Reidsville. "Not every kid was fortunate enough to grow up in New York or Chicago or L.A., they moved there from a small town," he says. "Most everybody I know from Chicago isn't from Chicago at all — they're from Springfield or Bloomington or somewhere." Most of the country, Barham points out, is made up of the spaces between the big-name cities. His spot on the map simply happens to be a piedmont town in between Greensboro and the Virginia border. He knows his own move at 18 from Reidsville to Raleigh parallels countless small-towners' flights from hometown to big city: the way he felt the first time he went downtown or saw Raleigh's skyline, he says, has to be what a kid from upstate New York felt crossing into New York City for the first time. The experiences are the same; the geography, interchangeable. "For me, the names of these songs — Rockingham, Reidsville — they're placeholders," Barham says. "Everybody who hears these songs is going to be able to internally insert their hometown name and feel something." Rockingham also represents Barham's first foray into fictional narrative songwriting. 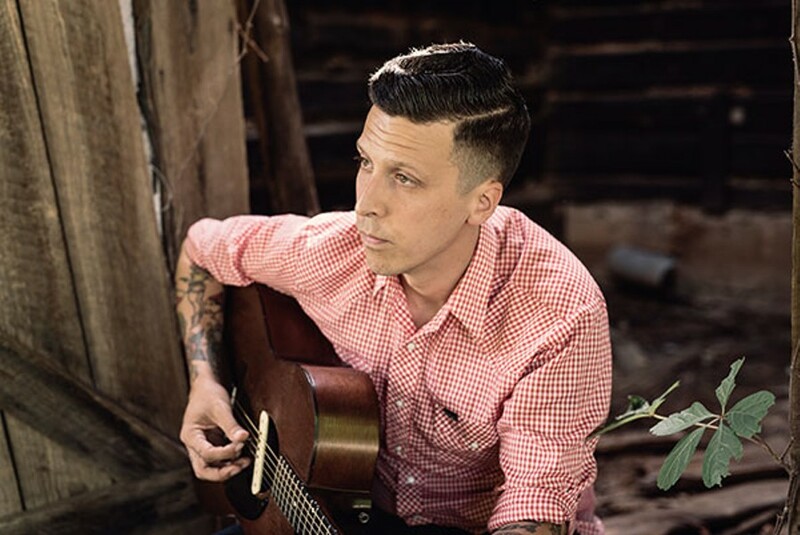 In American Aquarium, he always tells his own story. One can chart 11 years of Barham's life, from the drug and alcohol-fueled wilderness of this early and mid-20s to the married, stable sobriety of his 30s in the band's songs. This autobiographical sincerity, coupled with the hard-touring outfit's incredible work ethic, has earned American Aquarium a faithful fan base nationwide. On Rockingham, he steps out of that comfort zone to write other people's stories. "This is a record that kind of encapsulates what I think about my hometown — the good, the bad and the ugly," he says. It's an analysis of the brokenness of the American dream, too: his grandfather and father both grew up being told that success comes from working hard and being a good person. That isn't true, Barham says, raw frustration creeping into his voice. Both men worked 60-plus hours a week and barely kept their heads above the water. Barham knows stories like theirs are common throughout rural America. When he sings "I sit here on the line and watch these big machines / crush my hopes and dreams into Pall Malls and Lucky Strikes" on Rockingham's opening track, he's channeling his grandfather, sure, but also countless people in the same bleak situation. Barham lives many lives on this album: he's a failed farmer on "Water in the Well," a dedicated husband watching his wife succumb to dementia in "Unfortunate Kind" and a loving father who's painfully aware of the passage of time in "Madeline." Rockingham is populated with believable people who Barham writes tenderly and familiarly. In a way, he's known them his whole life. "It paints Reidsville not in a negative way and not in a positive way, just in a realistic way," says Barham.